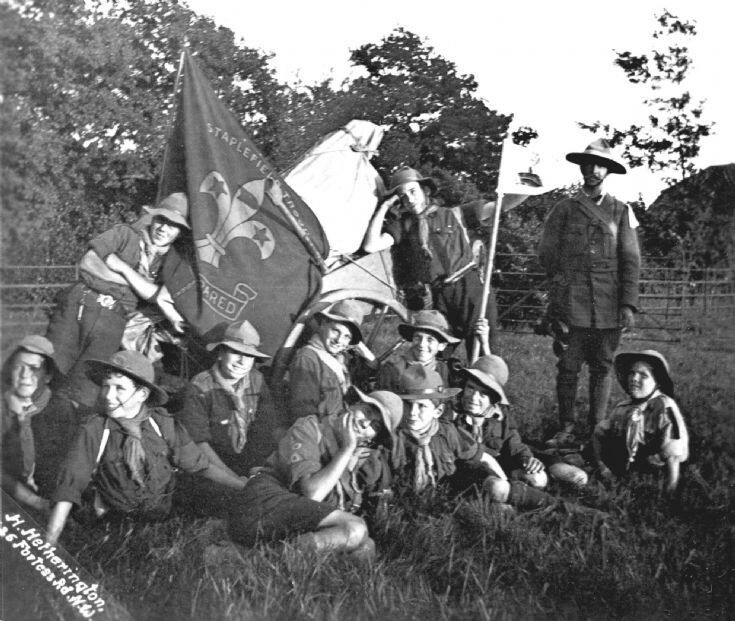 No information is attached to these photographs of a scout troop from Staplefield, other than the note on the reverse saying “Staplefield, Sussex”. The date has been estimated. The photographs were taken by a professional photographer from Kentish Town, NW London. The stave has a pennant being supported by a scout to display what seems to be an ocean liner. It was a very modern symbol to display on a pennant. Staves were typically 5’ for members of a patrol, but 5’ 6” for the patrol leader to allow for the pennant. Please can anyone add any names or supply more information on the troop? Henry Hetherington was active as a photographer at 125 Fortess Road, Kentish Town, London NW from 1911 to at least 1940.